Tucked away in northeastern France, nestled between the Vosges Mountains and the Rhine River, lies Alsace, one of the country's most unique wine regions. Small beautiful villages stretch up the vineyard slopes giving the countryside an almost Fairyland impression. Most of these meticulously maintained villages date back to medieval times and it’s common to see dates like 1504 or 1042 inscribed above doorways and towers throughout the region. Alsace lays at the border between France and Germany and has developed it’s own distinct culture, both linguistically and gastronomically, with Alsace currently boasting 26 Michelin starred restaurants, one of the highest concentrations in all of France. 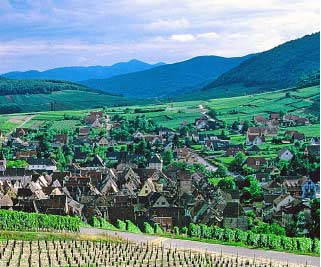 Alsace is the only classic French wine region that has built a reputation on the concept of varietal wines. Focusing primarily on whites, Alsace’s white noble grape varietals include Riesling, Pinot Gris, Gewürztraminer, and Muscat, with Pinot Blanc, Sylvaner, Chasselas and Auxerrois playing supporting roles. The region also produces the outstanding sparkling wine known as Cremant d’Alsace and some excellent Pinot Noir. Alsace’s vineyards possess the most diverse soil types found in any wine region in France. These varied soils impart subtle differences to the wines creating a mosaic of flavors and textures. A visit to the region provides you with a special opportunity to experience the melding of French and German culture and to taste some of the most unique and delicious wines that France has to offer. Getting around by car is essential and a drive down the Route des Vins, the “Wine Route”, is unforgettable. Most producers offer tastings and the countryside is dotted with welcoming degustation signs. Characteristically dry, aromatic AOC Alsace and AOC Alsace Grand Cru wines, 90% of which are white. 100% exclusively bottled in the region of production, since the law of 5 July 1972. Only the exclusive “flûte d’Alsace” bottle may legally be used. 15,600 hectares of AOC vineyards in production. Average annual production of AOC wines = 1.1 million hectolitres (more than 150 million bottles). 18% of the total French production of still white AOC wines.